59-year-old Gary Duffield owned the home the remains were found in. 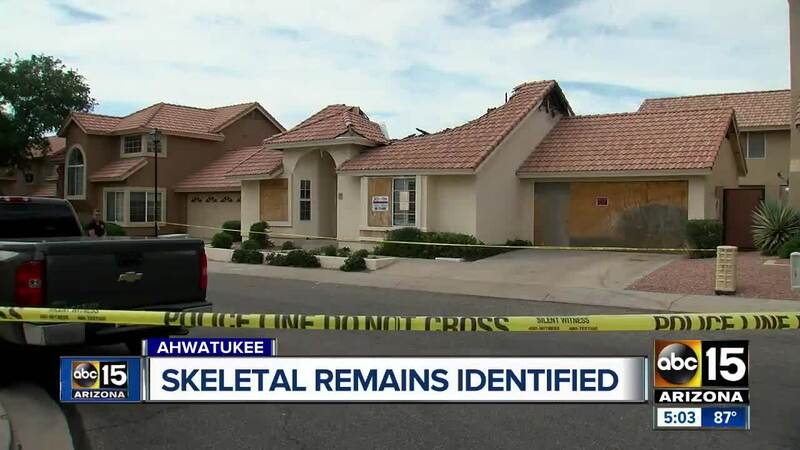 AHWATUKEE, AZ — Phoenix police have identified the human remains found in an Ahwatukee home that was badly damaged in a fire two years ago. Officials were alerted to the discovery near 38th Way and Ironwood Drive, near Ranch Circle and Ray Road, on April 4. The remains of 59-year-old Gary Lee Duffield were located inside the home by clean-up crews who came in to work after a recent ownership change. Aerial video over the home showed extensive roof and interior damage from a previous fire at the address that occurred on March 19, 2017. Fire officials told ABC15 the 2017 fire was under investigation for possible arson and accelerant was found at the scene. However, the evidence was inconclusive and the cause of the fire remained undetermined. "A cleanup crew came to start doing the cleanup process, so they could do the repairs whatever they needed to do and at that time they ran across some remains, some skeletal remains," Police Sgt. Tommy Thompson said. "We have information that an individual who did reside here was missing, shortly after the fire that report came in." A primary and secondary search of the home was done after the blaze, but fire officials say they could have missed Duffield during the searches. Part of the remains were reportedly covered by debris, which may have been why it was not discovered sooner, police say. Police say they are investigating Duffield's death as a homicide. There is no additional information at this time.